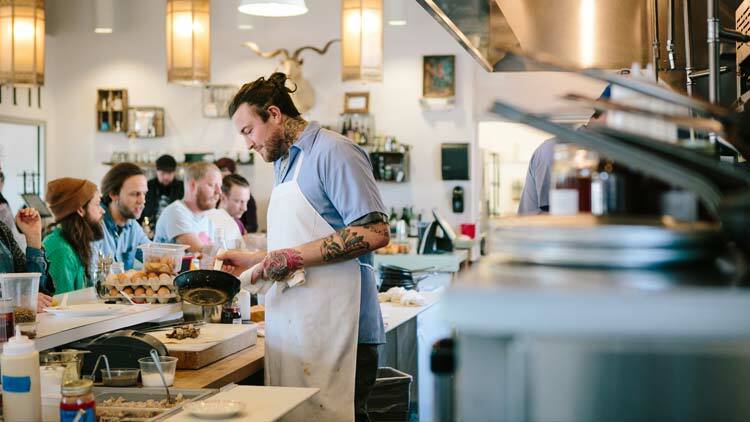 Indy's food scene is flourishing, and the nation is starting to take notice. 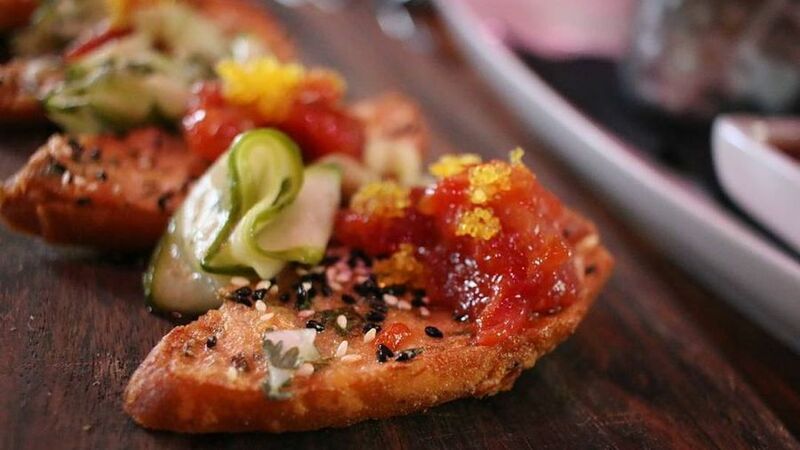 One of "America’s best places to go and eat in 2019" according to Food & Wine Magazine, there are a lot of delicious dining options in Indy. 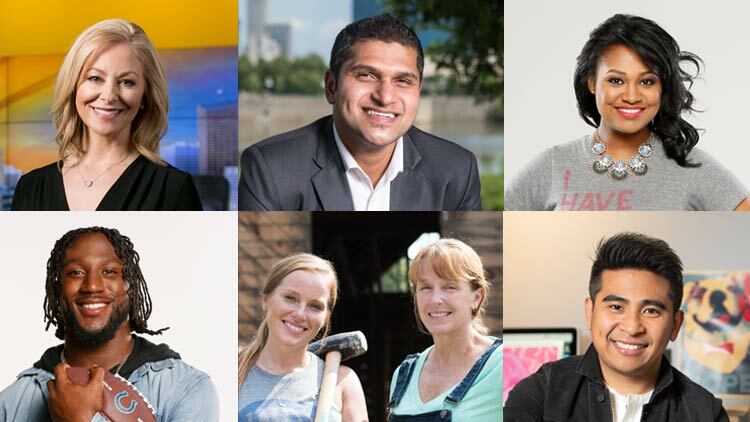 But we want you to try the best of the best, so we asked locals to vote for 25 locally owned restaurants that best represent Indianapolis. 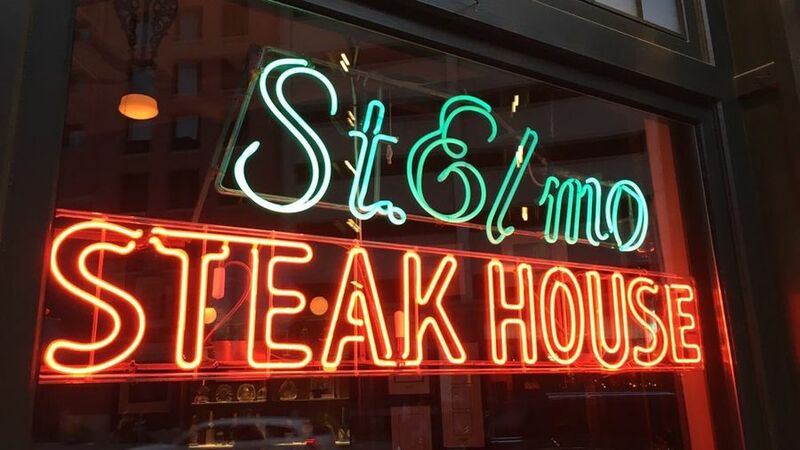 St. Elmo Steak House is Indy’s award-winning old-world style restaurant that proves great service and classic cooking methods make for a timeless menu worth visiting again and again. Known for: World Famous Shrimp Cocktail with spicy, signature cocktail sauce, traditional steak cuts or chicken and seafood paired with potatoes or classic sides. Drink menu: Equally weighted wine and beer menus next to classic martinis, mules, and Elmo Colas. Atmosphere: Early 20th-century decor inside the bar, large room, and private dining areas features wood paneled and brick walls with carefully curated art and photos. Yelp Insight: “Absolutely spoiled to live in a city with one of the nations' best steakhouses...Their famous shrimp cocktail opens up the sinuses and is well-worth the try. The filet literally melts in your mouth. When it comes to dessert, I always choose the chocolate cake - very rich, but delicious.” - Yelper Adam E.
Bru Burger Bar’s chef style and classic burgers, sandwiches, and salads were crafted with bold flavors to satisfy any burger enthusiast’s craving. 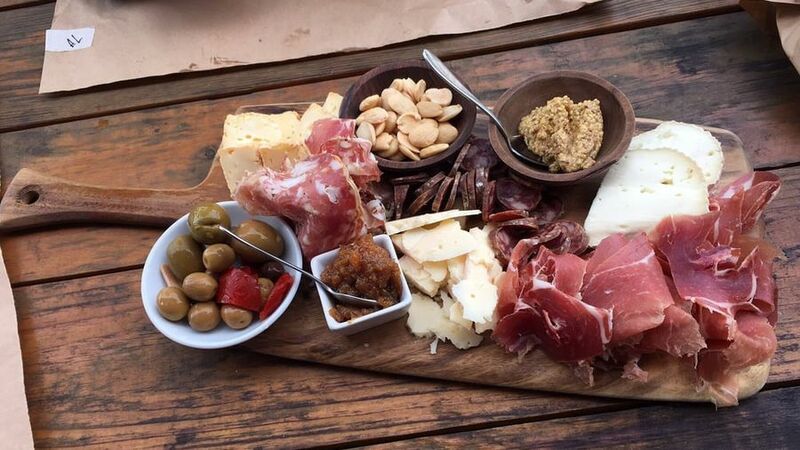 Known for: A hearty cheese and charcuterie “bru board” will start your meal off strong before you bite into gourmet beef, lamb, turkey and veggie burgers with toppings like sweet chili mayo and cucumber slaw or habanero hot sauce and havarti. Drink menu: 16 rotating craft bottles and draft options and over two dozen bourbons and whiskeys to drink straight or in a cocktail. Atmosphere: Sleek granite countertop bar with seating, brick walls, and wooden tables give an intimate and comfortable dining experience. 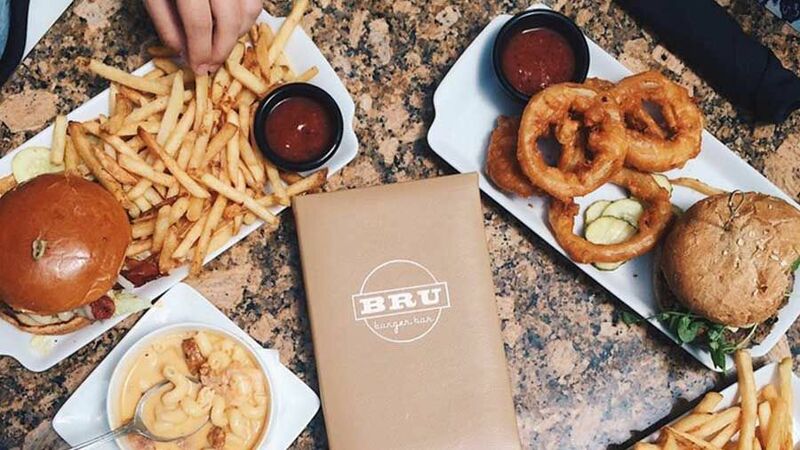 In the warm months, enjoy the patio that overlooks Mass Ave.
Yelp Insight: “Bru is a perfect burger bar. Walking on Mass Ave, the smell will lure you inside... There are options for any kinds of eaters, so it's a great choice for mixed groups (adventurous and non-adventurous, foodies or non-foodies, traditionalists or not).” - Yelper Jaclyn T.
Shapiro’s Delicatessen has served sandwiches, soups, and Jewish favorites in downtown Indy for 110 years. 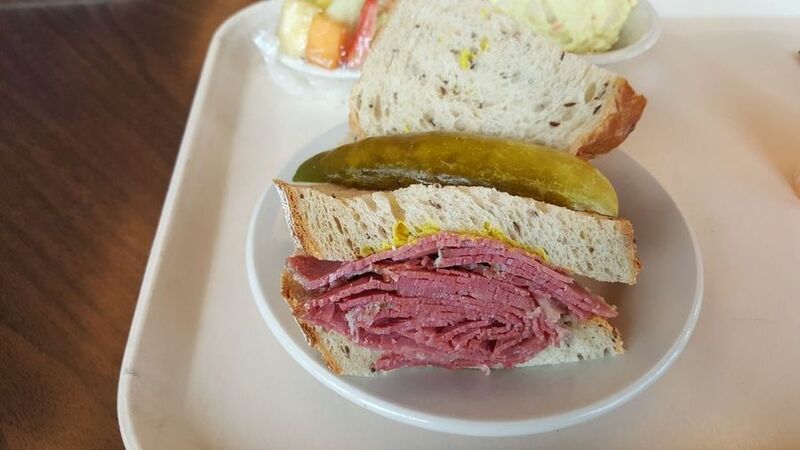 Known for: Corned beef and pastrami on rye, matzo ball soup, apricot rugelach, and bagels. Drink menu: Canned Dr. Brown’s soda, including Cel-Ray. Atmosphere: Shapiro’s large and open dining room hosts a bakery and grocery store, self-serve cafeteria line, and windows that remind you you're in a busy downtown district. Yelp Insight: “This place is nationally renowned for a reason… it is amazing. Their huge sandwiches are filled with kosher delicacies like corned beef and pastrami. It is a carnivores paradise. Come for the sandwiches but stay for the dessert. 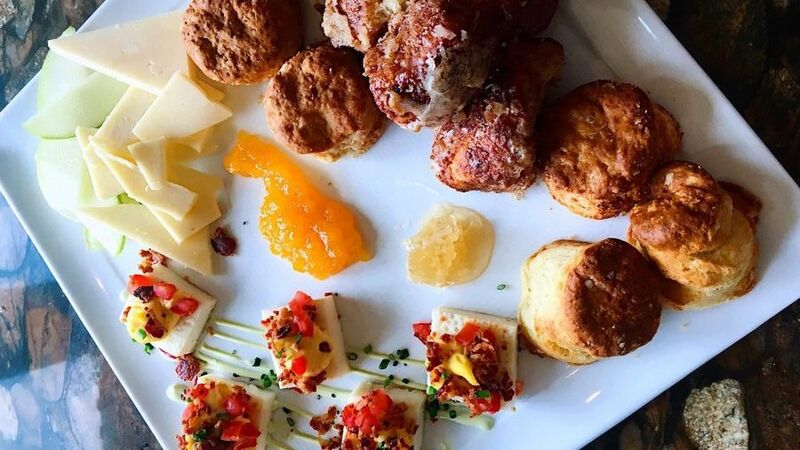 A selection of pies, cakes, cookies, and their award-winning cheesecake will make it hard to choose.” - Yelp Elite Rebecca L.
Martha Hoover’s Cafe Patachou is a must visit for both the farm-to-table sustainable menu and the impact of food and social change in Indianapolis. 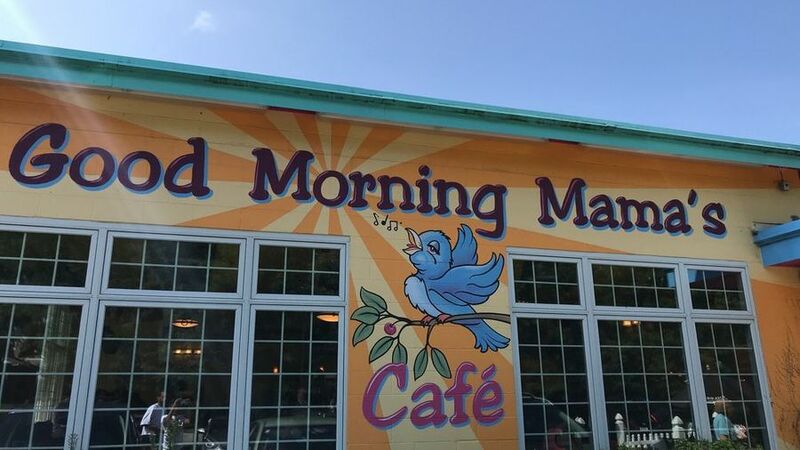 Known for: Farm-fresh breakfasts of omelets and broken yolks or vegan Cuban breakfast. Locals will tell you the Patachou chicken salad is a lunch must. Drink menu: Five types of mimosa and prosecco cocktails, self-serve coffee bar, yogurt smoothies, and juices. Atmosphere: Multiple locations across the city have many things in common, such as the clean lines and fresh white walls that allow the light to focus on the bright and fresh plates. Yelp Insight: “As soon as I took a bite of that cinnamon toast, my surroundings became white noise and I heard angels singing. The omelet was cooked to perfection and the bacon, oh the bacon! Some of the best bacon I've ever had... And the coffee... I tried their coconut cream pie coffee and was fulfilled.” - Yelp Elite Melissa C.
Since 1986, Bazbeaux’s has served dozens of signature pizzas with traditional and exotic toppings on handcrafted crusts alongside salads and sandwiches. 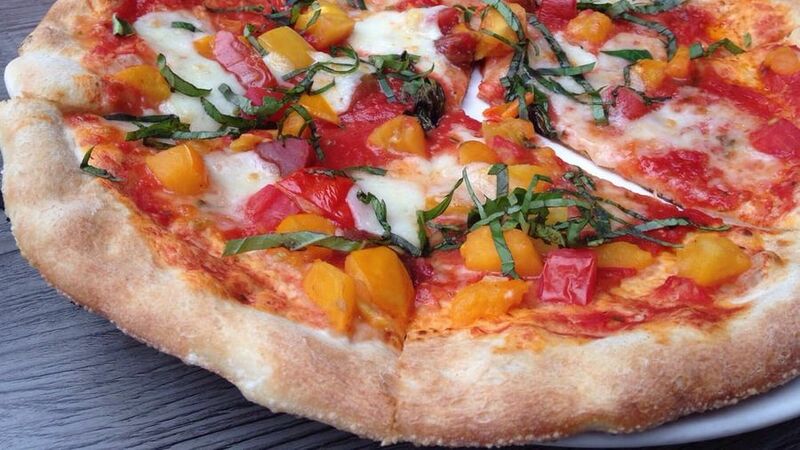 Known for: Unique pizzas with toppings like Cajun shrimp and peppers to pesto sauce and sun-dried tomatoes. Drink menu: Several wine and local beer options. Atmosphere: Both the downtown and Broad Ripple locations offer vibrant colors indoors and outdoor seating. 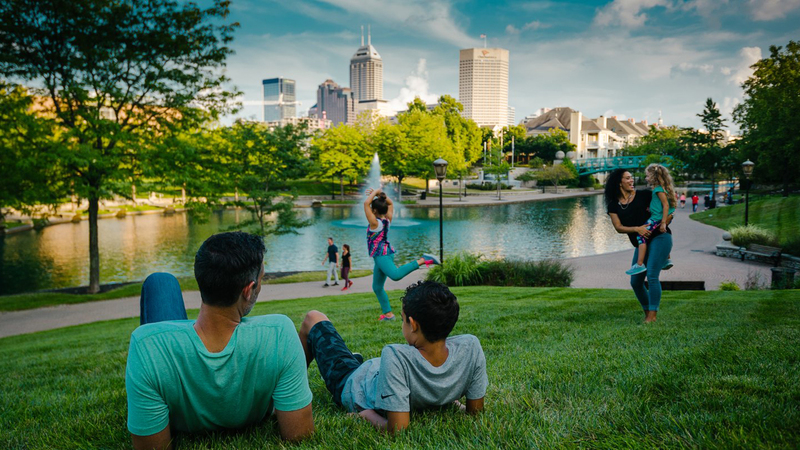 Be part of the Mass Ave buzz downtown or enjoy the views of the canal through the heart of Broad Ripple. 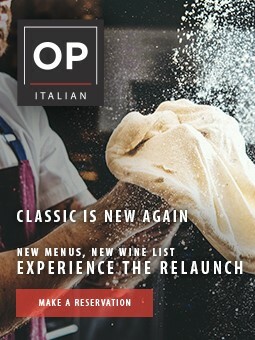 Yelp Insight: “This place redefines pizza... When I ate here, I was pushed into a world of wild options... The Luke (a twist on buffalo chicken) was mouth-watering... my friend’s Mediterranean pizza almost had me ordering another pizza... 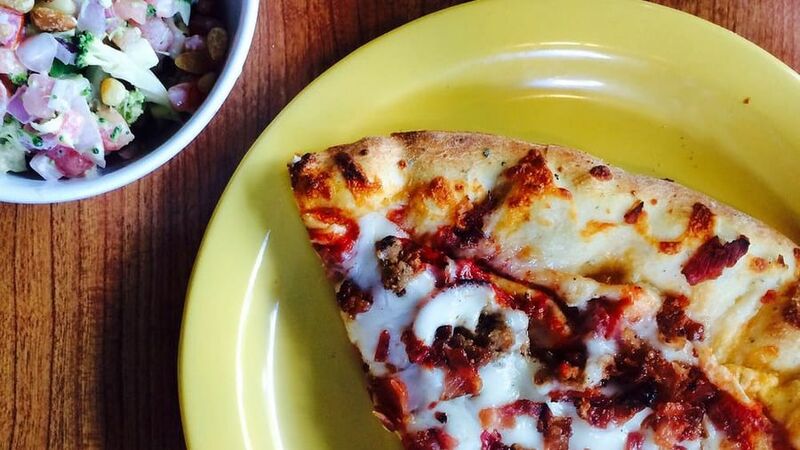 I DEFINITELY recommend stopping in and trying something new.” - Yelper Lucas V.
Jockamo Upper Crust Pizza is a family-friendly neighborhood pizza place that caters to all appetites. Known for: Slaughterhouse Five with five meats for carnivores, and the Jockamo Special with pesto, artichoke, tomato, cheese, and a balsamic reduction for vegetarians. Drink menu: Wine, local draft, and bottled beer. Atmosphere: Walls adorned with works by local artists, Jockamo is an open and inviting restaurant that feels like one big family dining room. 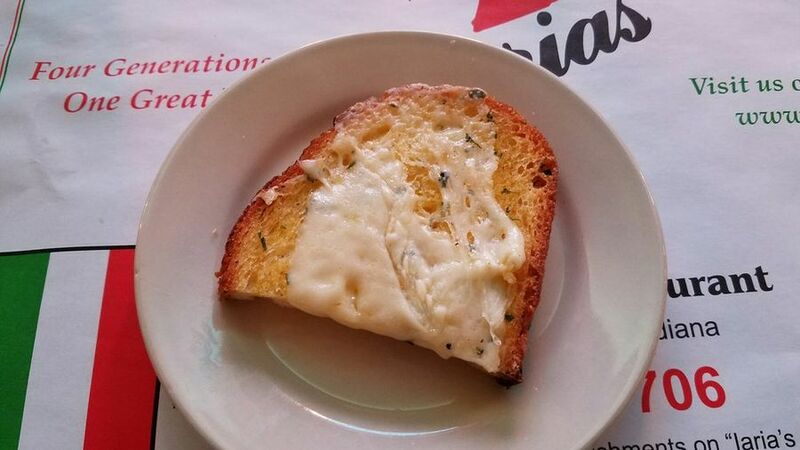 Yelp Insight: “The toppings were generous and the Gouda cheese bubbly. I couldn't wait to dig in. The pizza had a wonderful, doughy crust with a wood-fire flavor... I confess I went back for fourths it was so tasty.” - Yelp Elite Katherine A. Photo: Yelp Elite Marvin S.
Yats keeps Indy’s food scene alive and spicy with fast Cajun and Creole dishes that rotate on and off a daily menu. Known for: Crawfish etouffee, gumbo, the B&B, all served on rice and ordered with or without cheese, onions, and sour cream. Always get more bread. Drink menu: Soft drinks, beer, and wine. Atmosphere: Walk into any Yats location and prepare for a punch of bright colors and New Orleans-style decor, often adorned with restaurant accolades and Indy-centric memorabilia. Yelp Insight: “What a staple of the Indy food scene. Who hasn't been to Yats and not loved it? The food is simple: no-frills creole stews and such. The few favorites on the menu stay put while a crew of new and experimental dishes rotate through the lineup. My favorite is the ever-popular Chili-Cheese Etouffee. 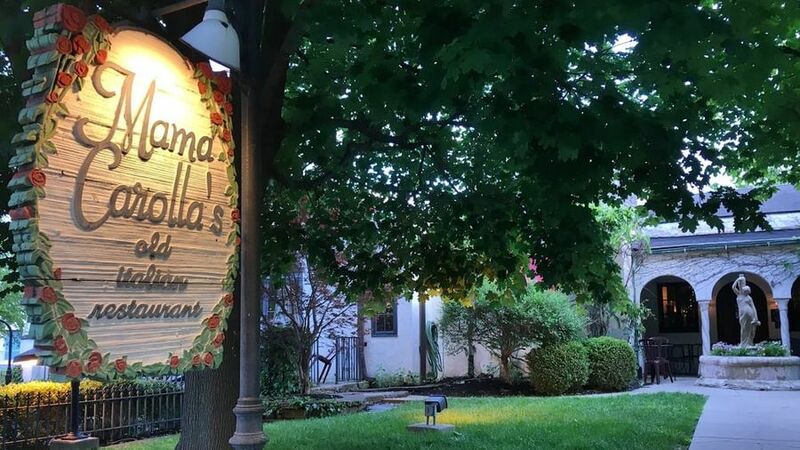 Come here for some fast, feel-good comfort food…” - Yelp Elite David M.
Photo: Yelp Elite Nisita K.
Mama Carolla’s is a Broad Ripple bungalow turned restaurant that serves classic, hearty Italian dishes in a relaxed dining experience that feels like being at your Italian grandmother’s home. Known for: Stacked traditional beef lasagna and creamy tomato bolognese mains that should be followed with cannoli’s and Holly’s Homemade Ricotta Cake. Drink menu: You can’t go wrong with a wine from “The Don’s” list, local beer, and house cocktails. Atmosphere: Relax and enjoy yourself in cozy dining rooms or, during the summer months, try the open patio that overlooks a busy section of The Monon Trail. Yelp Insight: “Mama's is a neighborhood institution. This cozy, little, villa-style resto was my ultimate date spot back in the day, and it still serves as a prime romantic getaway with my girl. Whether it's an upscale bottle, or a carafe-of-the-house Chianti, the wine prices are awesome... I always enjoy the specials, but the veal medallions is my go-to.” - Yelp Elite Lyle O. Photo: Yelp Elite Rob M.
Harry & Izzy’s is the casual and updated version of its sister restaurant St. Elmo that bridges steakhouse with modern American cuisine. Known for: Bridging the gap between classically cooked steak and seafood entrees with pizzas, sandwiches, and sliders that offer more options for a variety of eaters. Drink menu: Hundreds of bottles of wines from all over the world with staff ready to recommend them. Atmosphere: The large space is close and comfortable with a circular bar in view upon walking in before being escorted through stairs and rooms that lead to your table. Both the downtown and northside restaurants have a wine cellar that makes its appearance throughout the restaurant. 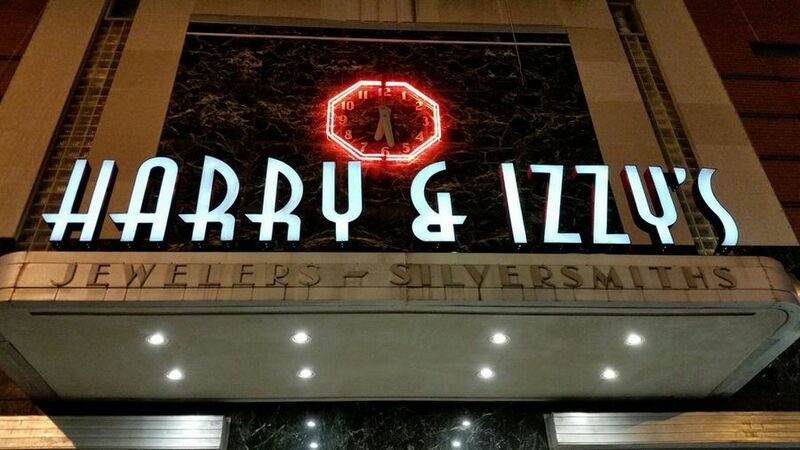 Yelp Insight: “Harry & Izzy's is St. Elmo's more approachable younger sibling. It boasts a great atmosphere, impressive wine and beer list, and friendly, but highly professional service. The restaurant is large, so you should be able to get a spot for four promptly on a regular day, but if not - note that the food is worth the wait!” - Yelp Elite Jake D.
Photo: Yelp Elite Joanna S.
Indy’s oldest neighborhood is home to a daily rotating menu derived from local farms at Bluebeard, named after a Kurt Vonnegut novel. Known for: Afternoon or cocktail snacks of pickles and cheese, pulled pork and kimchi sandwiches, or mains like roasted cauliflower or pierogi. Atmosphere: Step off the Indianapolis Cultural Trail into a renovated 1924 warehouse with wood floors, brick walls, and large windows that will let your mind time travel while your taste buds stay put. 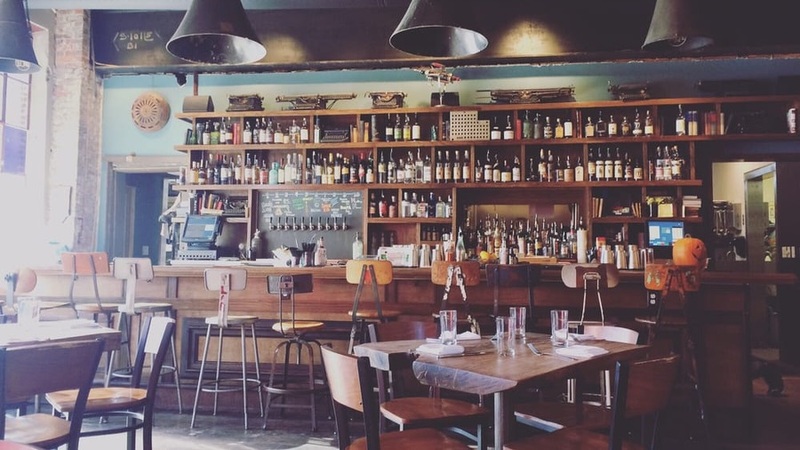 Drink menu: House crafted libations, sommelier-selected wine, and local beer. Insight: “Bluebeard is just a delight. The staff, the atmosphere, and my gosh, the food. With the menu always changing, it's hard to tell you what's good because it may not be there next time. But their homemade chips and dip, salad, bread & butter spreads, and entrées are just devine!” - Yelp Elite Lauren L.
Horse stable turned Latin-inspired restaurant, Livery relies on bright colors and dark furniture to transform your Indy dining night out into a southwest culinary experience. Known for: Order a one-plate entree like paella or the skirt steak with chipotle dry rub and chipotle butter, or bring friends to share yucca fries and six types of empanadas. Drink menu: Dozens of tequilas fill the drink menu that you can enjoy straight or as a cocktail, amongst other spirits, wines, and beers. Atmosphere: You might not see tumbleweeds, but you’ll feel as if you’ve been transported to another part of the nation inside this restaurant. Two-story seating and an open rooftop allow each visit to show a new view. 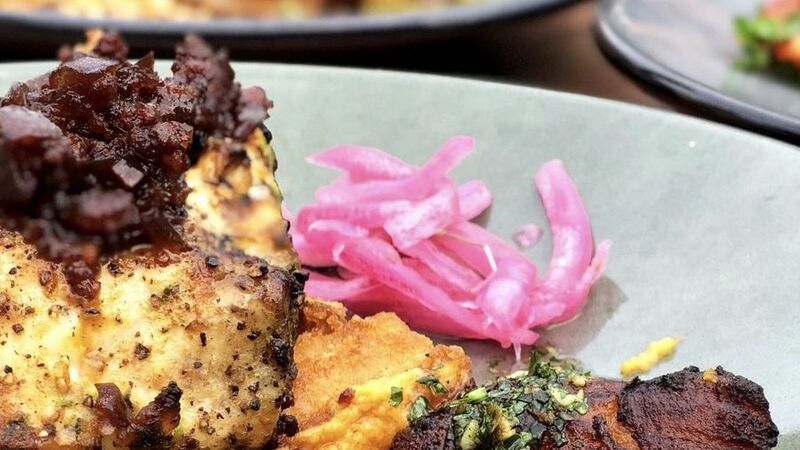 Yelp Insight: “Livery is a hip, very new-age restaurant that serves incredible, flavor-packed, Latin-inspired dishes served quickly and efficiently. The food is so good. It is one of the few "rooftop" restaurants in the city of Indianapolis…” - Yelp Elite Gyamfua G.
The modern neighborhood grocery and butcher shop that is Goose the Market caters to both ambitious home cooks in need of unique and select ingredients and hungry diners who want to bite into crusty bread sandwiches. Known for: Stacked charcuterie boards of thinly sliced meats and cheeses of all varieties and regions, daily sandwich specials like The Batali, gourmet grocery items, terrines, and fresh fish. Drink menu: Wine by the glass, local craft beer for dine in or carry out. Atmosphere: A hybrid grocery and sandwich shop with gelato bar on the ground floor; enjoy wine and beer tastings in the underground enoteca. Yelp Insight: “I just fancy this little gem... the employees are always nice and they have gelato that is just divine, unique smoked foods, and a downstairs bar that has small bites to accompany your adult beverage.” - Yelp Elite Nik L.
Milktooth is earning national accolades and awards with their unique brunch, coffee bar, and cocktail spot that’s worth the wait for a table. Known for: Local apple Dutch baby pancake, sorghum glazed bacon, spicy miso soup, and a seasonally rotating menu. 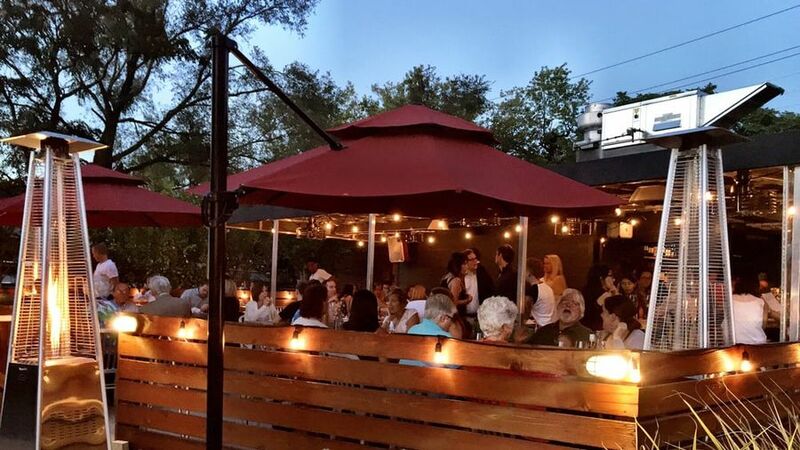 Atmosphere: This garage turned restaurant is best enjoyed both while sitting at the kitchen bar to watch the chefs cook your order or while hanging outside on the patio to enjoy the Fletcher Place neighborhood vibes. Drink menu: Home to Indy’s own ModBar espresso machine, handcrafted coffee drinks, house made cocktails and liquors. 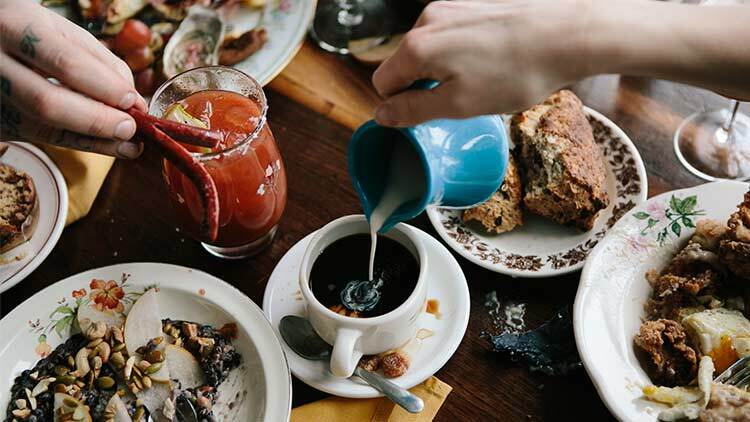 Yelp Insight: “Milktooth deserves all the glory, honor, and praise… It's one of the most interesting brunch locations you can find in the city. For a place with an always-varied, rotating menu, I am always pleased by how consistent they are... I mean, where else can you find curry butter biscuits with pomegranate molasses or thick-cut bacon with sorghum syrup that requires a knife and fork?” - Yelper Jeffery B. The Rathskeller is Indy’s authentic German restaurant and bier garden located inside the historic Athenaeum on Mass Ave. Known for: Family-style portions of pork schnitzel, sauerbraten, rouladen, and potato pancakes, along with steaks, seafood, and pasta worth grabbing a take-out container for. Drink menu: Dozens of German beers on draft or in cans and bottles, local beer, and American wines. Atmosphere: Private banquet spaces for parties and special occasions, dining rooms, and a bar seating area all in 19th-century style architecture. 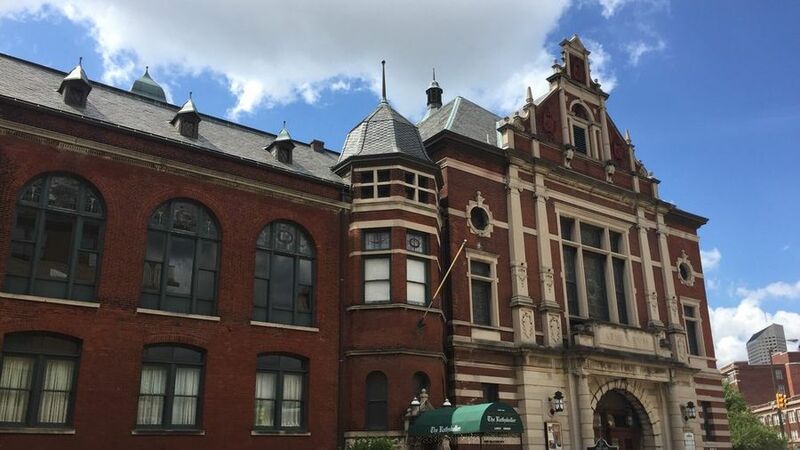 Yelp Insight: “The Rathskeller is always a good time. 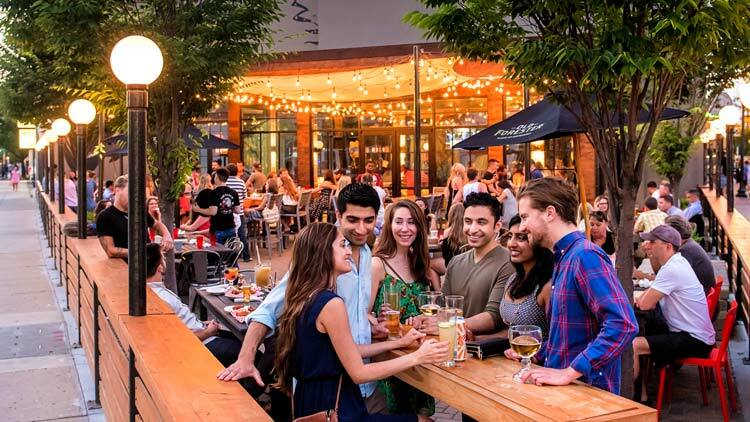 Whether you're here for an event in one of their many event spaces, eating dinner in the main dining room, or just grabbing a drink in the Biergarten, you're sure to have a good time. 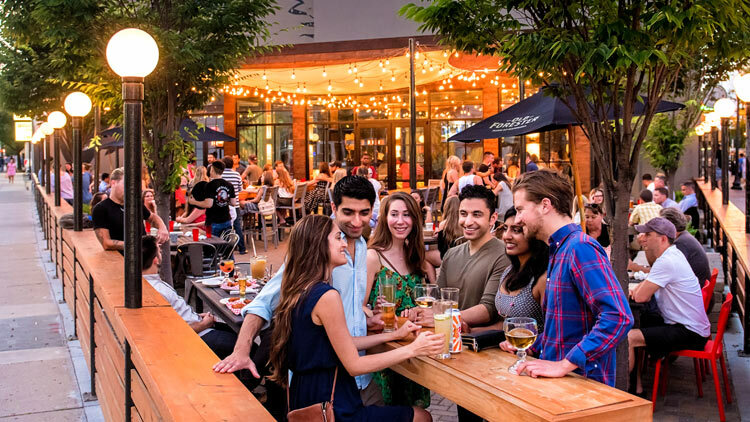 The building is beautiful and all the German-themed decorations make for a great dining atmosphere.” - Yelp Elite Jeremy M.
East Street’s Union 50 is a restaurant and bar fancy enough for date night and casual enough for game night with a group of friends. Known for: Too upscale to be called “bar food,” Union 50’s menu offers plates for one or more to share like beef tartar and poutine, or complete entrees like steamed mussels and beef tenderloin. Drink menu: Local craft beer, wine, house cocktails, and a page of American whiskeys will have you pondering your spirit choice while you soak in the light from the illuminated bar. Atmosphere: Late-night live music, skee ball, and shuffleboard juxtapose with open seating areas that offer a lounge-like experience. Yelp Insight: “Union 50 should get 50 stars. Here's the scoop. If you are in need of a restaurant for a killer first date or a nice business meeting, this is the place to be. The atmosphere is super nice. 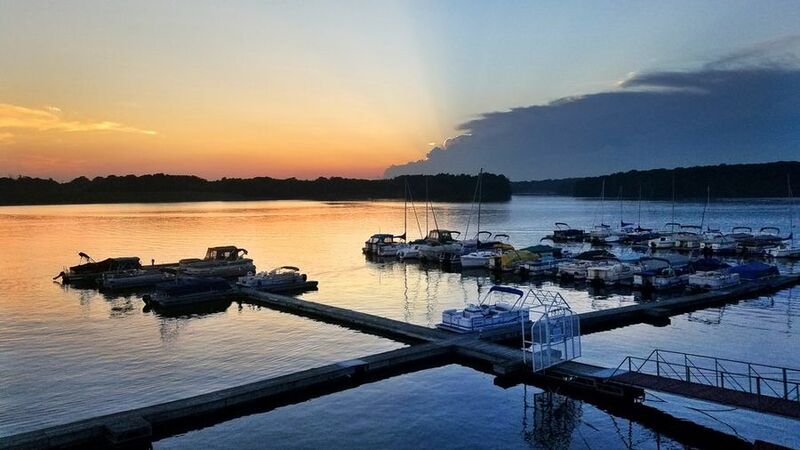 I'm talking dim lights with live music (on most nights) starting around 9 pm.” - Yelper Emily B.
Rick's Cafe Boatyard specializes in seafood, prime steaks, and pastas with inside and outdoor dining overlooking Eagle Creek Reservoir. Known for: Sunset cocktails overlooking Eagle Creek Reservoir. Drink menu: Local craft beer, wine, and singature, classic, and tiki cocktails. Atmosphere: Nested right on the Eagle Creek Reservoir, the restaurant is ideal for outdoor dining in warmer weather. Rick’s has both outdoor and indoor dining and cocktail bars, but wherever you sit, you’ll still see the lovely view of the water. 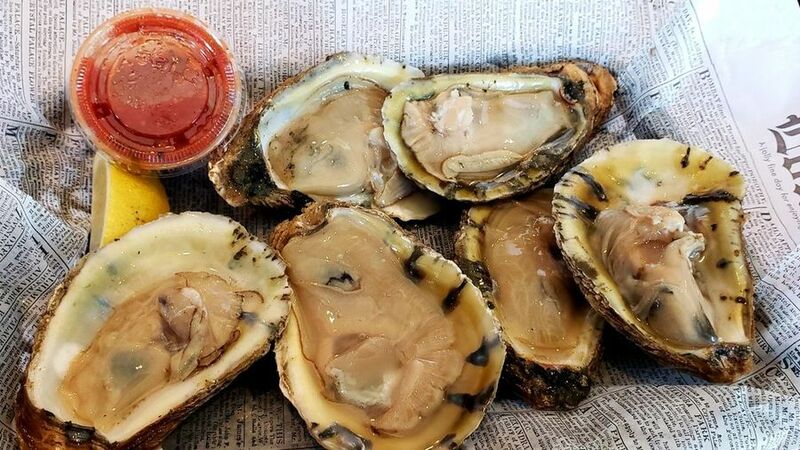 Yelp Insight: “Rick's has the best oysters rockefeller in the city! Best romantic recommendation is to dine around sunset on the patio to see a wonderful sunset view, overlooking Eagle Creek reservoir and the many sailboats out on the water.” - Yelper Marc L.
This family-owned business has more than 125 years experience in the seafood business and serves a variety of fish sandwiches - both grilled and fried - as well as lobster, octopus, calamari, scallops, and more. Known for: Fresh seafood delivered daily, carrying almost everything that swims! Lunch sandwiches are an Indy favorite and carryout orders can be placed online ahead of time. Drink menu: Fountain drinks, bottled sodas, and fresh brewed iced tea. Atmosphere: Casual, no frills spot to dine-in or take to-go. Yelp Insight: “Seafood lover here… If you are looking to satisfy your seafood craving in the Midwest, this is THE place to go! Caplinger's has an amazing showcase of fresh and frozen fish, shellfish and house made smoked fish dips, spreads, and salads. It's apparent by the stream of people coming through their doors, right up until the minute they close - that this place is good.” - Yelp Elite Angie M.
Photo: Yelp Elite Cory D.
Time hop back to the 1950s at this family-owned Italian restaurant nestled in the Fletcher Place neighborhood. Known for: Authentic Italian cuisine that includes all your favorites, especially the chicken tortellini and thin crust pizza. Drink menu: Refreshing martinis, a traditional and classic wine selection, and energizing bar seating. Atmosphere: This neighborhood gem offers booths and tables for everyone in the family. Traditional and idyllic, it is the perfect place to find your inner Italian. Best to make reservations, especially on weekends. Yelp Insight: “Iaria's has been a cornerstone of Fletcher Place for generations, since long before nearly all of its neighboring restaurants and bars even thought about opening. 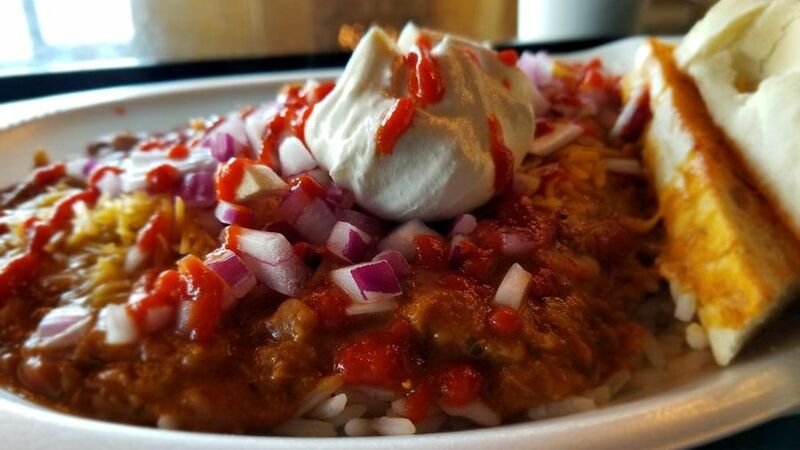 Everything is absolutely classic and done from scratch.” - Yelper Ronak S.
Photo: Yelp Elite Matt N.
A fast staple with locations on Indy's westside, as well as inside the Indianapolis City Market, The Tamale Place takes the hard work out of making masa and wrapping tamales in corn husks. Known for: Tamale varieties of slow-cooked chicken, beef, pork, and veggie with red and green sauces full of intense flavors should be ordered alongside tamale sliders and nachos with house-made chips. Drink menu: Jarritos and fountain drinks. Atmosphere: This grab-and-go spot takes up a small but mighty corner of the Indy City Market and is usually accompanied by a long line. Grab seating upstairs in the market or venture out to the plaza patio. Yelp Insight: “This is the best food in the contiguous United States. End of story. Every time I drive anywhere through the middle of the country, I will literally go hours out of my way to eat here... I am drooling writing about it. 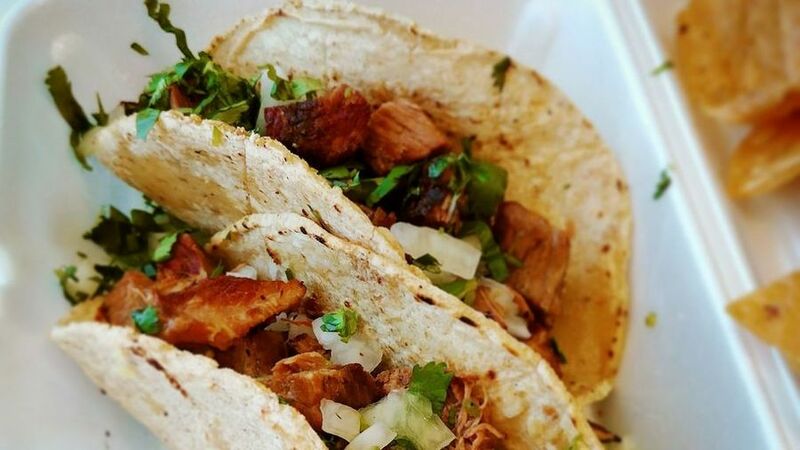 Truly authentic food, truly made from scratch, truly the best thing you could ever put in your mouth.” - Yelp Elite Marley H.
Photo: Yelp Elite Tia B. This SoBro brunch favorite is the perfect place to start your day. Known for: Original omelets and scrumptious French toast. Also try the Mexican Breakfast Tacos or Pasta Mama – spaghetti with eggs and pancetta bacon. Drink menu: Mimosas, Bloody Marys, other cocktails, fruit juice, and of course – coffee. Atmosphere: No matter how early in the morning you arrive, you’ll quickly wake up when you walk in the door. Brightly painted walls, colorful plates, and an energizing staff help you start your morning right. Be sure to get there with plenty of time – seating is at a first come, first serve basis. 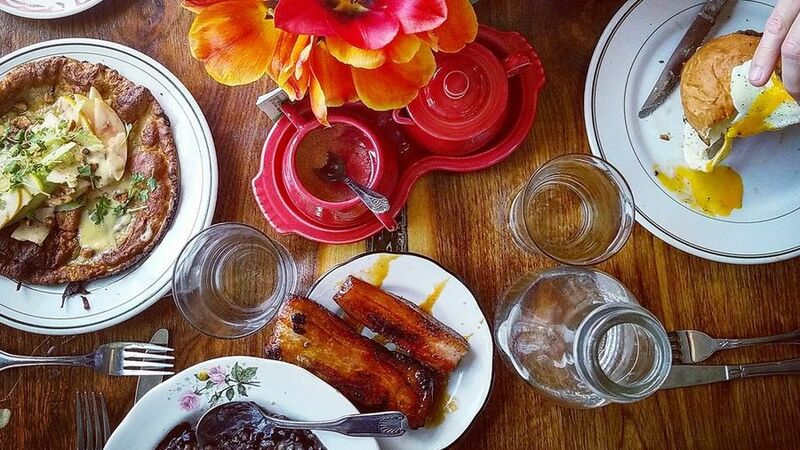 Yelp Insight: “Funky, colorful, and friendly, this spot serves inventive and delicious breakfast food! 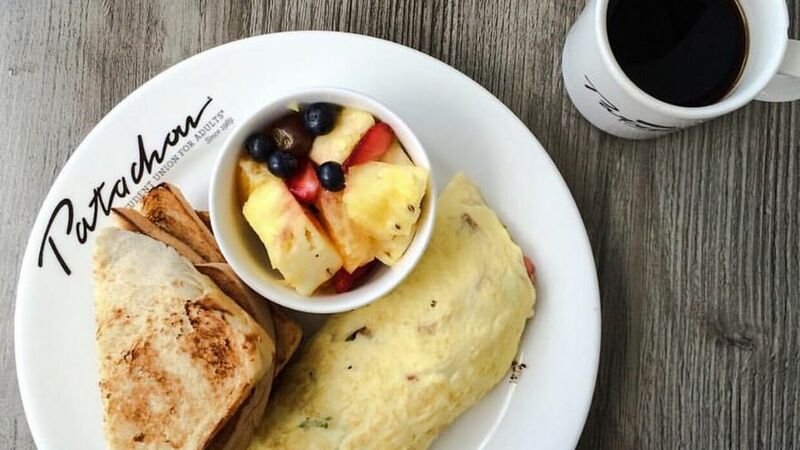 We tried the Florentine omelet, and chocolate chip pancakes, and eggs several different ways… all were terrific.” - Yelp Elite Scotty C.
Photo: Yelp Elite Brittany S.
Napolese Pizzeria takes everything you love about Cafe Patachou and serves it up as a pizza in a fine dining and farm-fresh approach. Known for: The slightly addictive double chopped house salad, signature or freestyle pizzas topped with cooked or raw ingredients like arugula, sandwiches, and daily rotating specials. Drink menu: Sparking water, full wine list, and Italian cocktails. Atmosphere: Classic service coupled with dark and metallic colors gives a modern, clean approach to dining fit for day or night. 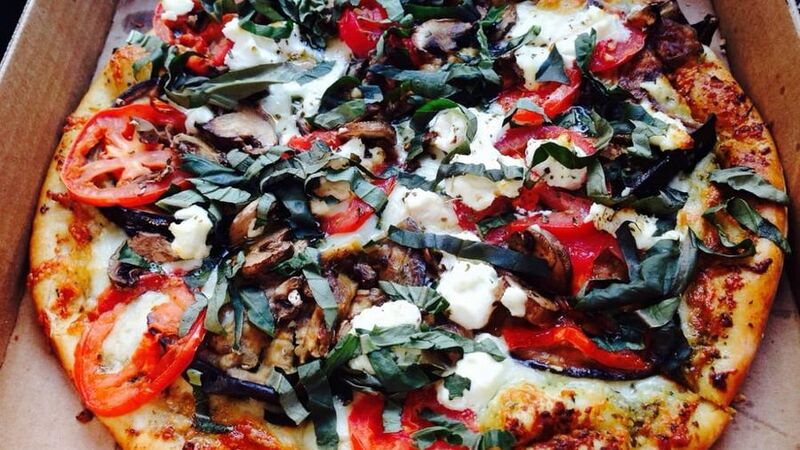 Yelp Insight: “The quality of the food cannot be beat - they offer amazing, gourmet, locally made toppings on a brick-oven crust. I've eaten here several times and there is not a single thing I've ordered that hasn't been out-of-this-world. I would like to especially praise their meats - much of their sausage comes from Smoking Goose (here in Indy) and it is always a cut above!” - Yelp Elite Trisha H.
Tinker Street’s tiny restaurant is bursting at the seams with the bold flavors served often vegetarian style in an upscale but approachable menu. Known for: A seasonably rotating menu with shareable plates like fried brussels sprouts and entrees of duck breasts and pumpkin gnocchi highlight the creative and modern vegetarian, gluten-, and dairy-free fine dining options. Drink menu: Wine list curated with each rotating menu. Atmosphere: Minimal accents and dark walls put the diner’s focus on looking straight through to the tiny-but-mighty kitchen, or enjoy the year-round patio. Yelp Insight: “I was just in awe of this place. If it wasn't the cozy blankets on the back of the chairs, then it was the complimentary shooter of champagne… First: the chicken of the woods mushroom soup - I'm still dreaming about it. Absolutely hearty and puréed to perfection, one of the best soups I've ever had.” - Yelp Elite Lauren L.
Photo: Yelp Elite Taylor S.
Mesh Restaurant is a contemporary dining experience on Mass Ave that takes familiar home-style plates and gives them a chef’s touch. Known for: Shareable plates like Kung Pao calamari and tuna nicoise to their staples of Amish chicken and mushroom strudel. If you’re here for brunch, get the breakfast burger loaded with hash browns, a fried egg, bacon, goat cheese, and dijon-maple gastrique. Drink menu: Multi-page wine list, house made cocktails, local draft, and bottled beer. Atmosphere: Granite tables, comfy bar chairs, yellow walls, and warm light let you step out of the busy street and into a relaxed and modern dining experience. Yelp Insight: “My group and I were blown away by this place. Great service from start to finish. 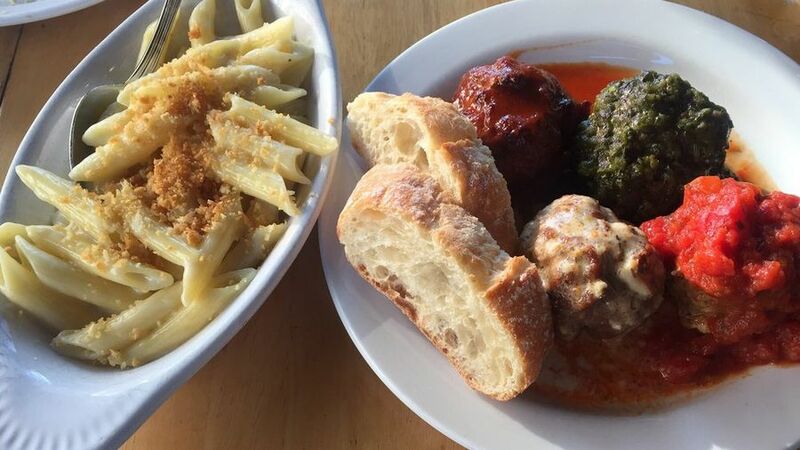 The menu is so creative and well-rounded… I would try everything on the menu if I could.” - Yelper Kate G.
Photo: Yelp Elite Cassandra F.
Mimi Blue Meatballs was created as a tribute to the great Mimi and her desire for home-cooked food coupled with a luxurious experience. Known for: Classic beef, turkey, or veggie-style meatballs ordered a la carte, on sandwiches or as sliders, and served with your pick of marinara, creamy or specialty sauces, and classic side dishes. Drink menu: Wine list and coffees. Atmosphere: Prohibition-style dining room with leather seating, dark wood, and ornate lighting. Yelp Insight: “Old faithful. Can never go wrong with Mimi Blue Meatballs! I ordered the bourbon bbq, marinara, Sriracha, and garlic meatballs - all were amazing. 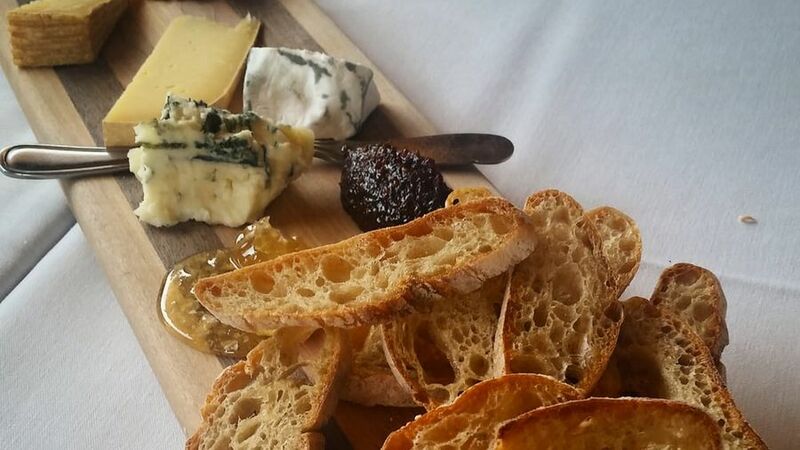 Never disappointed by Mimi's.” - Yelper Alejandra P.
Traders Point Creamery is a family farm that supplies a fully operating and sustainable restaurant located on Indy’s northwest fringe. Known for: Straight-from-the-farm charcuterie and cheese boards, the Farmhouse Smashed Burger, and the kid’s favorite Dairy Bar ice cream. 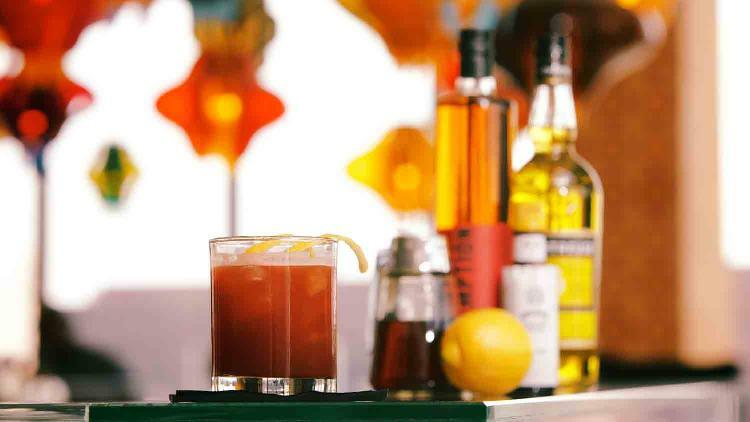 Drink menu: Start your brunch with Bloody Marys or mimosas or treat your drink as dessert with a late-night hot chocolate milk. Atmosphere: The farm flows into the restaurant that mimics a barn loft with tall ceilings and wooden walls and supports that juxtapose with a 1950s diner-like dairy bar. Yelp Insight: “Amazing, fresh, organic food served on a working farm in the rustic and quaint ambiance of a reconfigured 1800's barn. The food, service, and atmosphere were really perfect.” - Yelper Jai R.